A swim with dolphins in Cancun is an incredible experience fulfill of fun and learning, through which we can teach to the little ones about the environment and the world that surround them. Do you have doubts about if is an appropriate activity for them? You may not have enough information about it, but don’t worry! With the information next, you will know everything you need to know to give to your kids an unforgettable experience. In general, kids of all ages can live a swim with dolphins without any problem, but if they aren’t 8 years old at least is very important to have an adult companion, someone of his family is the best. In other hand, if your children are older than 8 years old and they prefer to do it by themselves, let them do it! Eventough your children are experts swimming, they must wear a lifejacket during their experience swimming with dolphins, is very important keep them safe in all the interaction, for human and for dolphins as well. Don’t worry about the size, we have lifejackets for all, including your kids, this way they will be secure all the time. The infancy is when any experience can be a real adventure. Can you imagine what it means for your children swim with the most intelligent mammal in the ocean? Play, communicate, dance, hug and kiss them, are just a few thing that they will be able to do with them, awakening their imagination with this moment. Before swim with dolphins, is highly recommended that your children learn more about this specie, their characteristics, feeding habits, behavior and the environment where they develop and belong. This way they can make questions to our Animal Care Specialists, which will increase their knowledge and learn the importance of keeping the balance in all our ecosystems, and also the respect for our flora and fauna. Besides, they can prove by themselves all they learned during the experience. There isn’t kid that don’r want to live this kind of experience. Book now and build magic memories in your children. 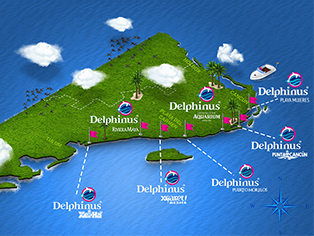 Would you like to know more about this swim with dolphins interaction? Know the different kinds of interaction that exists!